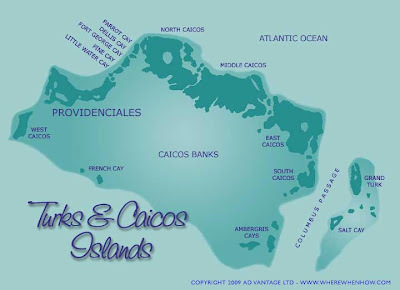 The average temperature on the Turks & Caicos Islands ranges between 85° and 90°F (29°-32°C) from June to October, sometimes reaching the mid-90s (35°C), especially in the late summer months. From November to May the average temperature is 80° to 84°F (27°-29°C). Water temperature in the summer is 82° to 84°F (28°-29°C) and in winter about 74° to 78°F (23°-26°C). A constant easterly trade wind keeps the climate at a very comfortable level. Grand Turk and South Caicos have an annual rainfall of 53 centimeters (21 in. ), but as you travel farther west, the average rainfall can increase to as much as 102 centimeters (40 in.). In an average year the Turks & Caicos Islands have 350 days of sunshine. Mosquitoes and no-see-ums can be a problem year-round. However, more mosquitoes come out during the rainy season, which usually occurs in autumn. If you come in the summer, be prepared for broiling sun in the midafternoon. If you want to know how to pack just before you go, check the Weather Channel's online 10-day forecast at www.weather.com for the latest information. Hurricanes -- The curse of Caribbean weather, the hurricane season lasts -- officially, at least -- from June 1 to November 30. But there's no cause for panic: Satellite forecasts give enough warning that precautions can be taken. 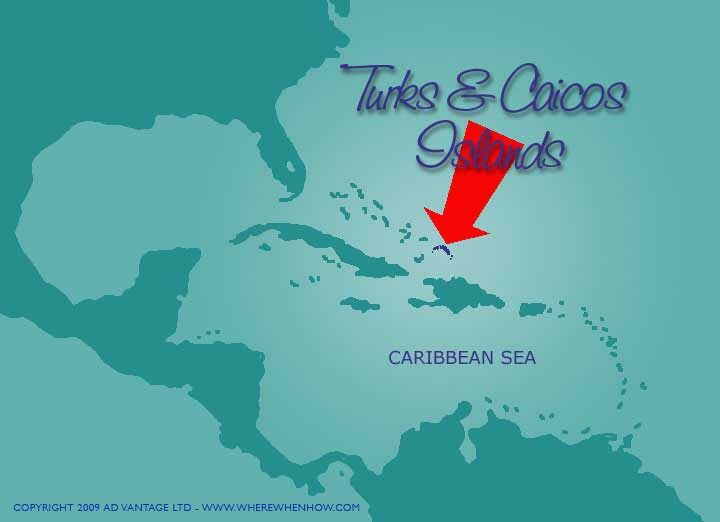 The Turks & Caicos have been spared serious hurricane havoc in recent years; some say the mountains of Haiti and the Dominican Republicweaken hurricane-force winds before the storms reach the TCI. Still,hurricanes have wreaked havoc here in the past, including a September 1926 storm that brought 150-mph winds, slammed boulders on beaches, and had a storm surge that moved 1.2km (3/4 mile) inland. In 1960, Hurricane Donna dropped 51 centimeters (20 in.) of rain in 24 hours. So it has happened -- and no doubt will happen again. Always monitor weather reports if you plan to visit during hurricane season. Check theWeather Channel on the Web at www.weather.com. Like much of the Caribbean, the Turks & Caicos have become a year-round destination. The "season" runs roughly from mid-December to mid-April, which is generally the driest time of year in the Caribbean and the most miserable time of year in the northern U.S. and in Canada. Hotels charge their highest prices during the peak winter period, and you'll have to make your reservations well in advance -- months in advance if you want to travel over the Christmas or New Year's holidays or in the depths of February, especially around Presidents' Day weekend. The Easter holidays/school spring break is an increasingly popular time for families to visit. The off season in the Turks & Caicos -- roughly from mid-April to mid-November (although this varies from hotel to hotel) -- is a perfectly nice time to come to the TCI: Yes, the temperatures are somewhat higher, but the southeasterly trade winds work to temper the heat, as do the brief but more frequent rain showers. The off season is also one big sale. In most cases, hotels, inns, and condos slash 20% to 50% off their winter rates. Airfares are generally cheaper, and air/hotel packages can be very reasonable -- even for stays at the top luxury lodgings. But because the TCI has become so accessible from many North American cities, it's becoming more and more popular as an off-season destination. 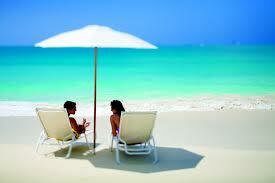 For many Europeans, who generally have longer vacation times, the summer is already a favorite time to visit the TCI. Note: Some hotels use the off season for refurbishment or bustling construction projects -- which can prove to be an annoyance if you're looking for peace and quiet. Make sure to ask what, if any, work is going on. If you decide to go anyway, ask for a room far away from the noise. New Year's Day (Jan 1); Commonwealth Day (observed on the Mon nearest Mar 12); Good Friday (celebrated the Fri prior to Easter); Easter Monday (celebrated on the Mon after Easter); National Heroes Day (observed the last Mon in May in honor of the First Chief Minister, the late Hon. J.A.G.S. McCartney); Queen's Official Birthday (observed mid-June); Emancipation Day (celebrated the first of Aug; this holiday commemorates the freedom of the slaves, which was declared from Oddfellows Lodge in Grand Turk in 1834); National Youth Day (celebrated the last Fri of Sept); Columbus Day (celebrated on the Mon nearest Oct 10; this holiday commemorates Christopher Columbus's "landing" on TCI in 1492 -- although no firm evidence exists to confirm that the explorer actually made a landfall here at all); International Human Rights Day (observed on Oct 24; this holiday is similar to the USA's July Fourth celebration); Christmas Day (Dec 25); Boxing Day (Dec 26; on this day the annual Church Fair takes place in the Grand Turk Methodist Church). Junkanoo (www.tcimall.tc/calendar/junkanoo.htm) is held island-wide from the early hours through to sunrise on New Year's Day, with most outrageous costume competitions, the best drummer challenges, and more. Model sailboat races and other festivities are part of theValentine's Day Cup (tel. 649/941-7639; middlecaicos@tciway.tc), which takes place on the Saturday closest to Valentine’s Day. The Turks & Caicos Music and Cultural Festival (tel. 649/946-4970), on Providenciales, stretches for 8 days in July with big-name talent topping the festivities. Restaurants vie to win top honors for best conch concoctions at the Turks & Caicos Conch Festival (www.conchfestival.com), held the last Saturday in November on Providenciales.